I like the ideas about secretly incorporating healthy things into yummy things, but i think the recipes need a little tweaking. Jessica Seinfeld offers a program that gets kids to eat their vegetables - without them knowing! As a mother of three, Jessica Seinfeld, like many busy parents, used to struggle to get her kids to eat right. In Deceptively Delicious, she shares her solutions: easy, mouthwatering recipes that even the most overwhelmed families can make - stealthily packed with unseen veggies, pureed so kids will never suspect. Deceptively Delicious has all of Jessica's winning combinations, including cauliflower in mac and cheese and spinach in brownies. She also shares tips on making healthy snacks and improving store-bought foods, as well as advice on creating a positive environment around the kitchen table. 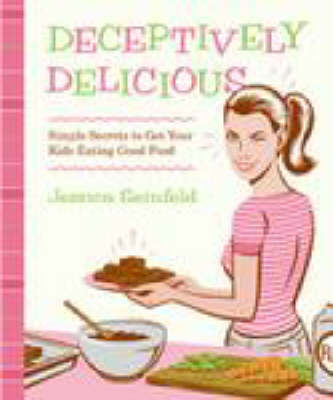 Deceptively Delicious is a godsend for all parents who want healthy kids, peaceful family meals, and to never again have to say, Eat your vegetables!